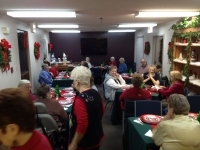 The Wesley Senior Ministries Foundation is committed to provide for the enhancement of the day to day living and general well-being of the elderly residents of the Wesley Senior Living Communities. Christmas is an all-important time to fulfill that mission. The Foundation provides a Christmas dinner and a gift for all the over 2,000 dear people we serve in the 30 communities spread across West Tennessee, Jonesboro, Arkansas and Murray, Kentucky. For many, this will be the only Christmas meal and gift they would receive. This past Christmas, the gift was a photo-sensitive nightlight to remind these dear people of the scores of people within the Memphis Conference who love and support them through this ministry. The nightlight represents the light we are called to bring into the world to lift the dark veil of loneliness and despair. It was wrapped in a festive glimmering metallic bag. The bag was like getting a second gift for many. We were in Camden, TN at a Christmas dinner and celebration. After the delicious meal, I got to do what had quickly become one of my favorite parts of working for the Foundation playing the role of Santa Claus and handing out the gifts to those in attendance. The gratitude and appreciation in the eyes of our residents would melt any heart. As I made my way through the tables and to the back of the room, I spotted a mere wisp of woman sitting with her back to the wall. Her snow white hair and gentle smile that would make you almost forget the oxygen tubes encircling her head. As I approached her, extending my hand with the gift, she shook her head, “no” and motioned me closer. I knelt down and leaned in to hear her whisper above the cheerful sounds of the Christmas party. “Could I have a hug?” she inquired. Absolutely! There could not be a more powerful testimony to the importance of the mission work done by the Wesley Senior Ministries Foundation. Every day everything we do, positively impacts the dear people we serve. Thank you for allowing the chance to share this simple message of the transformational aspect of our works.